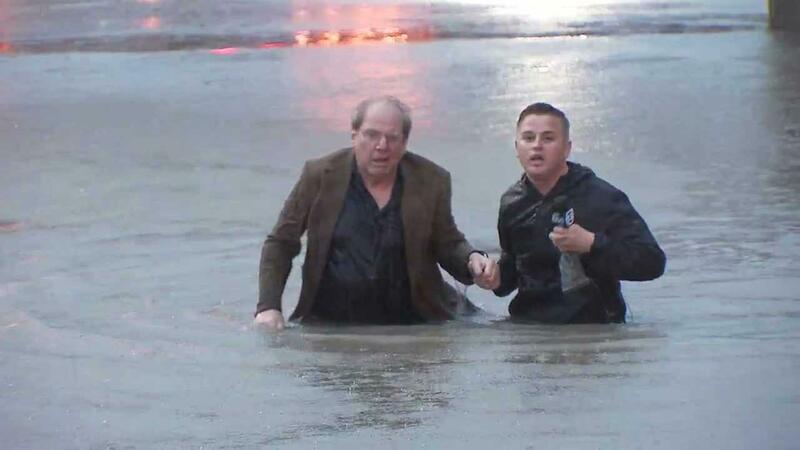 KTRK reporter Steve Campion ended up doing a lot more than his day job during flooding in Houston-- he saved a man's life in the middle of a live broadcast. If you haven't seen the video, go watch here. It's really something. And yet, somehow, the internet has found it to be very important that Campion be shamed for his tone while rescuing the man. 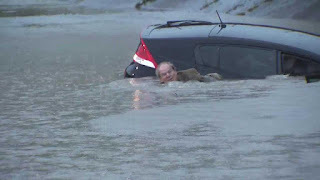 Campion hollered to the man to swim from his sinking car. The video shows that the victim began to understand Campion's instructions and eventually did begin to swim-- a move that may well have saved his life. But numerous bloggers (apparently self-appointed experts in swift water rescue) couldn't help but remark that Campion seemed "annoyed" during the rescue. Indeed, Campion does seem flustered while yelling back and forth with the confused driver, who had trouble understanding Campion's advice to abandon his sinking car. "Ugh is right, Steve," declared one of the more prominent posts circulating on social media about the incident. "I, too, would not want to muddy my reporting pants until absolutely necessary." Several people voiced frustration about this to Campion on his facebook page. "Next time, be a man and put your microphone down and do something," wrote one person. 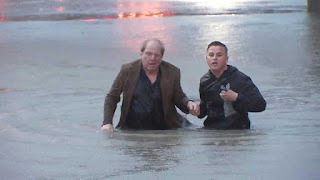 "Like maybe help the old man out of his sinking vehicle and walk him to safety." These critiques are asinine. Campion DID do something. He focused on how to help the victim help himself. Reviewing this video, I don't hear frustration from Campion so much as I hear concern. Regardless of that distinction, he is damned well right to be flustered. Campion is not employed as a swift water rescuer. He had no lifesaving equipment at his disposal. Yelling instructions to swim was the best and safest thing Campion could have done in that moment. The old way of teaching water rescue was to "reach, row, throw, go." (Boy Scouts pretty well drilled that into my head.) Today, the Red Cross teaches a modified version, which ends with "don't go." The reason is simple: a decision to go to a drowning victim is extremely risky. You can die trying to help. So put yourself in Campion's soggy shoes and actually think about the consequences. Campion first tries to get the driver to rescue himself instead of going to the man: SMART! Campion then appears to wait until the driver reaches water that's shallow enough that his feet can touch the ground: ALSO SMART! Campion literally gave himself leverage by conducting this rescue in the manner he did. 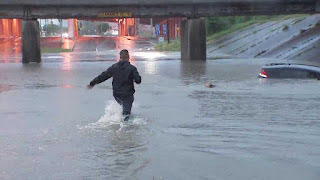 He preserved the ability to use his leg strength to help haul the struggling man to safety, and gave himself a fighting chance of breaking away if the victim started to panic. The reporter's actions were nothing short of heroic. 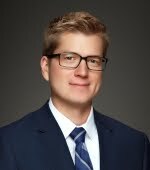 He focused a victim's attention and then rendered aid when he felt he could safely do so. Did he hesitate? Yes! And he should! That doesn't show any sort of cowardice on Campion's part. It shows a person who's thinking about how to come home to his loved ones alive at the end of his shift. I couldn't have blamed him for choosing to keep out of the water altogether. So, somebody give Campion a medal, and let's get the blogosphere back to shaming Kardashians. PS-- As for holding on to his microphone through the ordeal: I do not know whether Campion would have had a place to set the mic down. It's a tool of his job (which is to inform the public of the exact danger in this scenario) and he's right not to toss it into the water if there's no compelling need to. I don't see how it interfered with the rescue. It's not Campion's fault that the driver ran into danger during the middle of a life shot-- that's just how it happened. Brandon, I agree, everyone thinks they become an expert on the internet. I think he did just fine. He saved the guy's life and all people can do is criticize him. I guess, ignorance is bliss when you're not the one doing the rescuing. Why would anyone think that it is the reporter's fault? The driver clearly didn't care about his own safety when he chose to drive directly into a flooded area. If anyone should be shamed it should be the idiot behind the wheel. I teach Boy Scouts lifesaving techniques. The younger Scouts are taught how to use a pole to reach to a victim, and how to use a rope or buoy if there is no pole or if the person is too far out. I then ask them "What do you do if he's too far out to throw a buoy or rope to?" They generally answer with some attempt to swim out to help him. I tell them "No. You stand there and watch him drown. Better one person dies than two." Until they're old enough to teach swimming rescue techniques to, that's the proper thing for them to do. I was watching this live and Steve did the right thing. Man appeared to be in shock and Steve got him to move. In the end he saved the man's life. Thank you for writing this. I also believe that it was right for the reporter to use caution. I also share the belief that he is a hero. 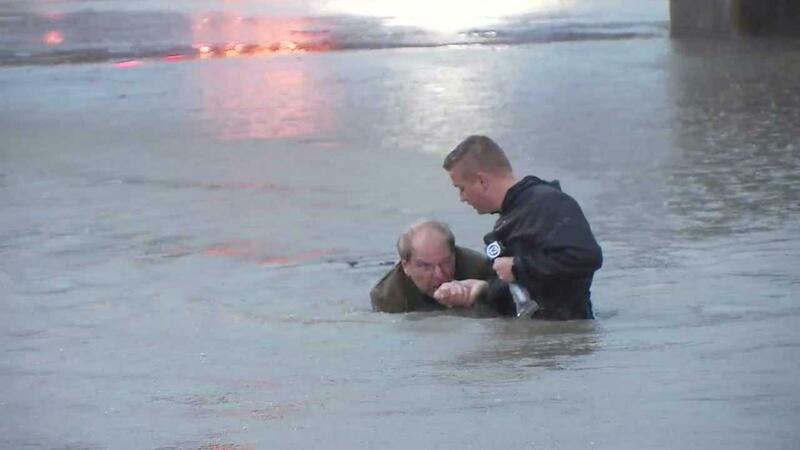 I'm sure the man was truly thankful the reporter was there to help him and saved his life. very funny and impressive web log, it puts smile on my face , i actually enjoyed reading it, gorgeous articles, keep sharing additional with this,have a nic evening.